It isn’t the changes that do you in, it’s the transitions. Change is inevitable. As human beings we continue to evolve and adapt. However, the concepts of change and transition are different. Change is situational; it is the external event that is taking place. 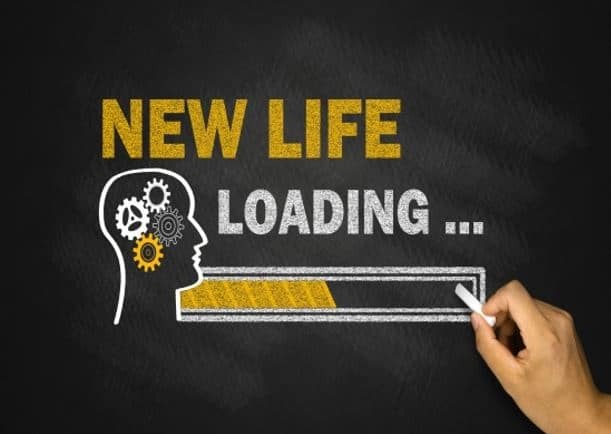 You may be experiencing any number of changes – a new job, new relationship, end of a relationship, death of a loved one, retirement, starting university, etc. Change can happen quickly, and it is not always in your control. Transition, on the other hand, is the inner psychological process that people go through as they internalize and come to terms with the new situation that the change brings about. The starting point for dealing with transition is not the outcome but rather the endings that people experience in leaving the old situation behind, even if the change is viewed as positive. 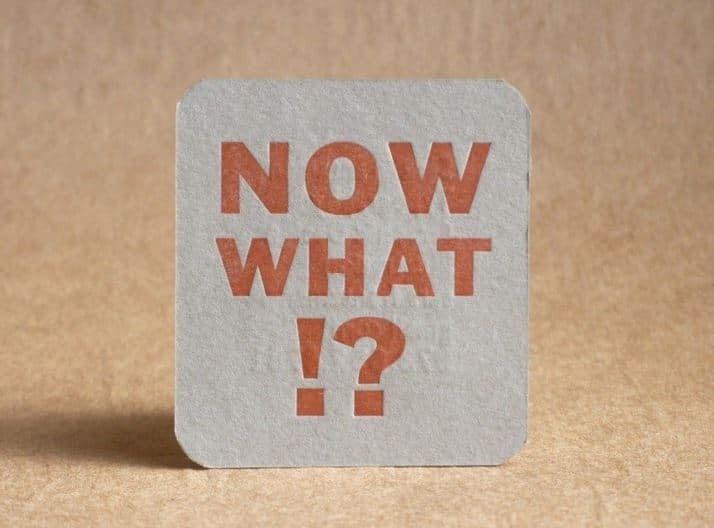 In order to successfully navigate change, Bridges suggests that you need to understand the process of transition which includes three parts: endings, the neutral zone, and new beginnings. Transition starts with an ending. This first phase of transition begins when you identify what you are losing and learn how to manage these losses. You need to identify what is over and being left behind, and what is positive…what you will keep in your life. You may be experiencing grief as a result of an ending. 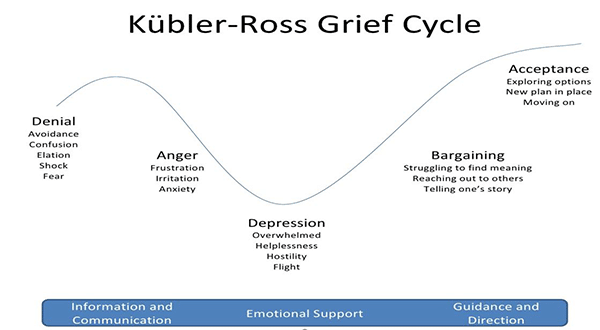 Kubler-Ross is a common model used to explain the stages of grief and the kinds of support that are helpful at each stage. While the Kubler-Ross model shows a linear flow, the picture below the model shows that grief is personal and can be messy. Many people find some sort of symbolic ceremony helpful in this ending stage. If this is a negative change perhaps try writing down all the things you are spending negative energy on and burn them or send them off in the wind. You may want to use meditation or mindfulness techniques to help you reduce negative thoughts from cycling though your mind. But you may also be taking positive things from an ending and it is important to identify those as well. Perhaps your relationship is ending but you will carry on seeing joint friends and family. If you are moving houses you can have a drop-in party for people to share memories made there…anything that you can think of that will help in letting go. If you don’t spend time and helpful reflection in this stage, you may always find one foot (metaphorically speaking) back in the past. You can also think of past endings and how you got through those successfully. Think about the internal and external resources you used or relied upon. These may include friends, professional resources, and perhaps spiritual beliefs to name a few. These resources and the knowledge that you have successfully managed transitions before can bring your strength and confidence in your new situation. This stage may be like trying on some new clothes or a new pair of shoes. Are they me? Will they be comfortable? Narrative therapy may be helpful here – moving from a problem based self- story by re authoring or creating your new story and walking yourself into it. Beginnings involve new understandings, new values and attitudes. Beginnings are marked by a release of energy in a new direction – they are an expression of a fresh identity. Bridges notes that well-managed transitions allow people to establish themselves in new roles with an understanding of their purpose. They are reoriented and renewed. This is an opportunity to confirm your own character, values and beliefs. You have begun to do this in the neutral zone but now you are able to firmly answer the questions: Who am I? What do I stand for? What do I want to be remembered for? It can be very helpful to make these explicit by writing them down. 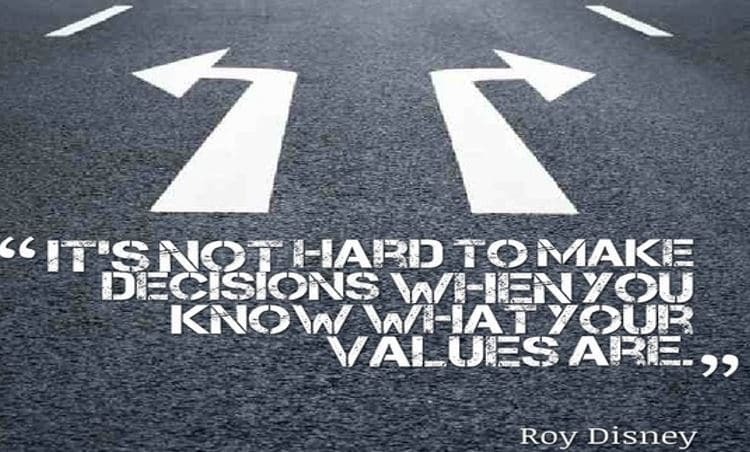 Your values and beliefs guide your actions. These kinds of reflections can be useful to refer to when faced with challenges and there are many models that may help focus this work such as Ikigai. You could also try taking a survey such as the VIA which helps you identify your character strengths. These types of exercises help you ground yourself as you move forward with a clear sense of self. This article is adapted by Karen Heslop from the work of William Bridges, an author on organizational change.